The bottom line is that, no matter what kind of surfing level and ambition you arrive with, there is always something on offer from The Surfer. We offer a wide array of packages for every kind of surfers and if there is anything special you need just let us know! 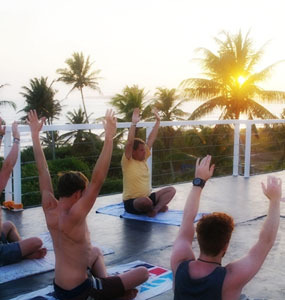 If you are looking for a thrilling surf & Yoga experience in Sri Lanka then you have come to the right place! 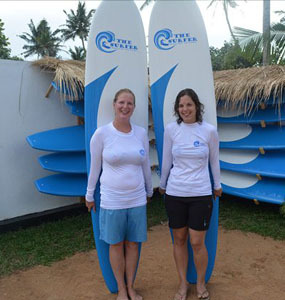 The Surfer is a surf camp located at two beautiful locations right near by the beach in weligama ! both places located right next to a beginner surf spot, addionally all around us along the beautiful coastline there re nine to ten more surf spots withing 10 minutes radius. Hands on heart we are more than happy to say The surfer situated smack in the middle of the best surf area in Sri Lanka. TS2-Weligama Surf Camp is located 5 minutes from Weligama town center and just 100 meters from a hidden beginner break in the area, The whole complex is two stories with 06 bed rooms with private bathrooms and a roof top chilling restaurant area. The bottom line is that, no matter what kind of surfing level and ambition you arrive with, there is always something on offer from The Surfer. We offer a wide array of packages for every kind of surfers and if there is anything special you need just let us know! FULL SURF GUIDING PACKAGE OR MODERATE SURF GUIDING PACKAGE. 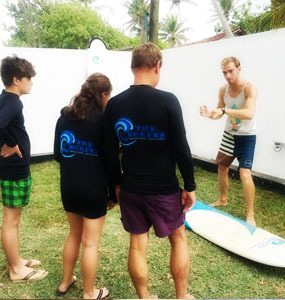 The Surfer is situated in the best spot on the beach in front of a less crowded beginner break and walking distance to the Weligama main spot as well as easy access to reach another nine to ten surf spots within a ten minute radius! We offer three surf packages: LEVEL 01 for beginners, LEVEL 02 for those that have been in the water before and the Surf Guiding package for those already ripping around in the waves. 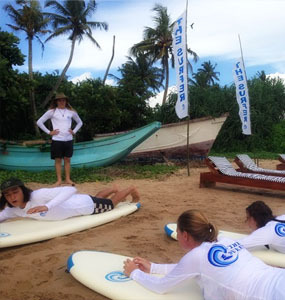 The Surfer's team of Instructors are all experienced surfers and speak English fluently. All of them are native Lankan, Germans, Dutch, Scandinavians or British with good local knowledge. Our goal at The Surfer is to get you up and ripping the waves as fast as possible!